The conference is over for another year and I must say I was really glad that I decided to go to this one. 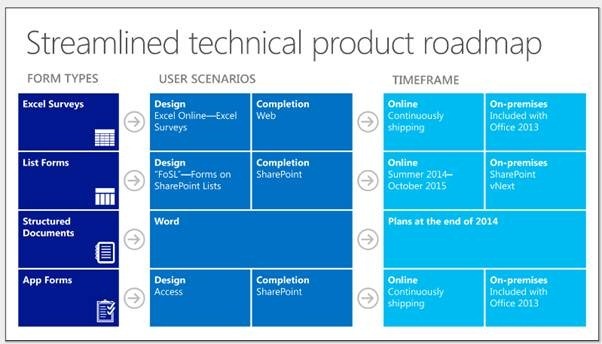 The energy and enthusiasm that was missing from SPC12 seemed to be back, and whilst we didn’t have a new version to shout about, there were plenty of announcements coming throughout the conference. I had set myself a personal goal of networking much more effectively than I had at the last two conferences and I’m really pleased that I was able to meet up with a lot of old friends from around the world, as well as make friends with a whole bunch of new people. Being active on Twitter, there are a lot of people that i talk to all the time but have never met, so it was really nice to be able to touch base with them. All in all, this was a great conference for me, and well worth the personal investment of time and money to attend. The rest of this post covers off the Keynote and the InfoPath session which formed one of the more important sessions for me over the week. During the keynote, the first of these announcements came to light (Although thanks to a DST slip-up, they hit the Twitter verse about an hour too early!) and this was the Office Graph. The key focus of phase 1 of Office 365 was to introduce SharePoint, Exchange and Lync to the online world, phase 2 is about empowering the user and changing the way we work. The tagline from the conference was “Work like a network”. Office Graph is an extension of the Yammer Enterprise Graph interface which maps the relationships between people and information, by recording likes, posts, replies shares and uploads. This is now being extended to Office, using signals from email, social conversation, sites, IMs and more to map the relationships between the various parts of the business. A new app Codenamed Oslo has been created to help people start to dig into the Office Graph. Using search heavily, Oslo allows you to look at insights based on searches such as “Presented to me”, “modified by me”, “Trending around me”. With additional changes to the integration of groups in office and Yammer the focus on social business is really starting to solidify. 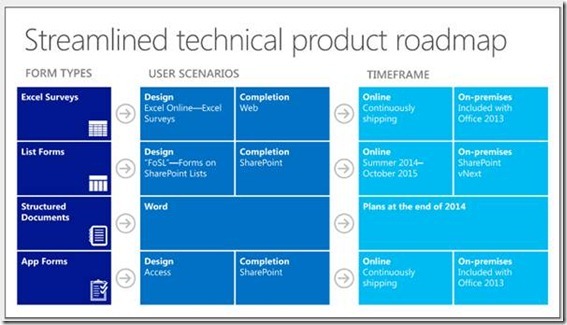 Off the back of this however comes the question as to what happens to SharePoint Social? The quick answer is it’s pretty much dead and will not be extended any further. The key message from MS is “Go Yammer” and look to using the Hybrid functionality that will be coming to on-premises installs soon. During this announcement, MS also announced that they WILL be releasing a major software updated in 2015 for on-premises customers. Personally, I’m expecting this to just be a feature parity release to bring on-premises installs up to a similar level as office 365. However make no mistake if you want the latest and greatest features you will have to move to office 365, On-premises installs will always be several feature sets behind and Microsoft have made it clear that this stance won’t change anytime soon. Also shown to us during the keynote was the Office 365 Video portal, housed in Azure we’re looking at a business focussed OfficeTube.. I’ll let you draw the parallels there. Service Pack 1 has been released and should now be considered the baseline for all CU releases. The current SP includes all CUs upto Dec 2013. · New compliance capabilities such as Read auditing. · Yammer on/off switch, redirects the Newsfeed link to Yammer. This was a key session for me, so much so that I skipped breakfast and went straight to the room to get a seat at the front. And I’m glad I did as the room was very soon at capacity and people were turned away. Why so busy? well I guess we all want to know what the successor to InfoPath was going to be. As a product it has divided the IT community, with some loving the power that it brings to end users whilst others hate the issues it brings to areas such as the migration story and the maintenance issues that can arise. Personally, I think InfoPath has a place in SharePoint and I’m sad to see it go. That said, it’s supported until 2023 so it won’t be going anywhere soon. Microsoft did promise however to tell us more about what’s in-line to replace it and they did say that InfoPath would be supported in vNext (2015 release). After discussing why they had taken the decision, and looking at some of the alternatives such as Contextual Apps (These featured heavily during the week.. think side bar apps in outlook etc..), FoSS – Forms on SpreadSheets AKA Excel Surveys they then started to show us the Form vNext option. This came with the caveat that the journey is just starting. This time Microsoft want to engage with the community regarding what features are needed. You can take part in this conversation at http://officeforms.uservoice.com , At the moment MS are gathering requirements but they do have an Alpha product which was displayed during the session. 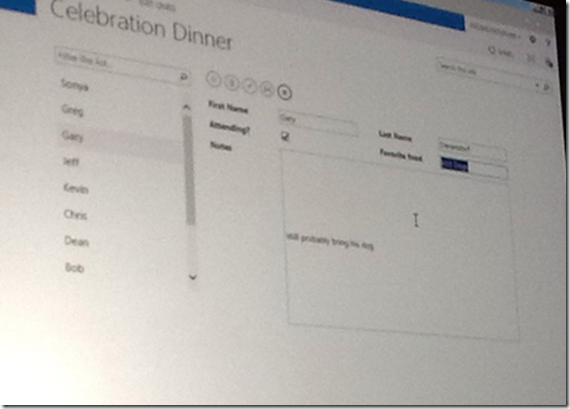 Entitled FoSL – Forms on SharePoint Lists, the demo came with a heavy caveat that this was Alpha code. The intention is to ship this mid to late this year, Office 365 will get it first Autumn 2014 with On-Prem receiving it in vNext. The basic entry point will be a ribbon button which will appear alongside the “Customise in InfoPath” button (Confusing? Possibly..). 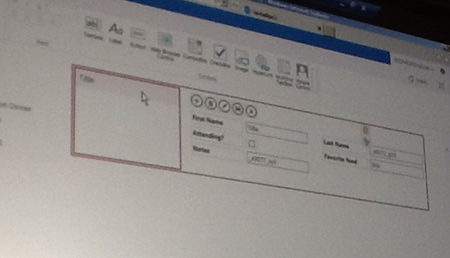 This will take the user into an automatically created web based form that uses the Access engine to display. The controls on the page will be editable in the browser, allowing for size and layout changes. The controls will snap to an underlying grid on the page to assist with the layout and resizing of controls on the page. When opened as a new list item you can see the resemblance to the Access Engine. In the next 3-6 months, they’re looking at adding auto formatting, lookups, cascading drop downs (My ears pricked up at this!) and workflows. The key here is lowering the bar to entry this is an end user feature. Over the latter part of the year, they also intend to look at Business rules to allow for the kind of logic seen in a lot of InfoPath forms, the ability to show/hide sections, make it touch device friendly, integrate personal profile and other O365 objects. Later in the lifecycle we should see Service Calls, Enterprise data and eSignatures. After these bombshells, the team also talked about Structured Documents, basically forms within word that allow the stripping of data out of the form. This already exists in one style within word, however the intention is to streamline this and make it more compatible with systems such as JSON and HTML. Following this they touched on App Forms, basically using Access Services to create mini data driven apps. I’ll be posting more information from the conference as I work through my notes and the Session slides and videos become available.